Traveling on points gives you opportunities you may otherwise not have. This is why I use points and miles to travel. It allows me to see the world at a fraction (not free) of the cost it would otherwise. It’s not about the journey, it’s about the destination. Sure, business and first class are really unique and experiences. Everytime I fly in a premium cabin (for miles and taxes) I feel really lucky. But if I didn’t have enough points or nothing was available, I’d still travel. I’ve flown economy and I’d sure as heck do it again. We don’t control award space. Sometimes the biggest challenge in booking an award ticket is securing open award space for your itinerary. The one thing I’ve learned after a few years and helping numerous clients is that we have no control over award space. Part of the learning curve here is learning the different trends but also realizing that we’re at the mercy of the airlines. The Chase Sapphire Preferred is not the best credit card. The travel rewards/credit card space is really crowded. (Thanks for reading!) If you keep up with other blogs, the Chase Sapphire Preferred – and now Reserve – products get pushed a lot. They’re both excellent products. But it has to make sense for YOU. Not for me or for anyone else. For YOU. Never pay an annual fee. To minimize extra expenses, you should always do what you can to avoid an annual fee. This can be done by earning statement credits or receiving retention offers. Many cards come with the first year fee free. Some, however, do not. And that’s okay. If you get enough benefit out of it, then it may be worth considering. I’ve opened up a lot of cards in my lifetime, but I’ve always kept my credit score and report in check and in mind of my accounts. Your score and your credit health matter. Remember that credit utilization – the total amount of credit you’re using at any time across all your credit lines – and payment history, are the most important. Life happens. Part of life happening for some people is debt – credit card, or otherwise If you’re spending more than you have to earn a sign up bonus or earn extra points, then stop earning points. Right away. Switch to a debit card or cash until you’re in a better situation. Paying late fees and interest on credit card bills detracts from your rewards gained and makes your travel even less frugal. This post isn’t meant to dissuade you from credit cards, miles and points. It’s meant to give you a different perspective on points, miles and credit cards. These are not absolute truths – these are my truths. A bit of a PSA, below is a recent scenario I encountered and how I made the best decision. 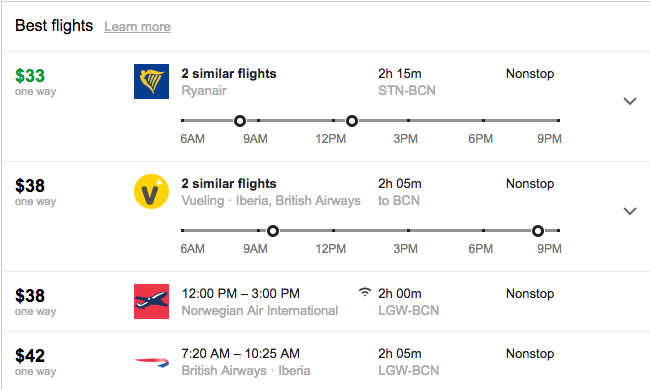 I recently booked a trip from London to Barcelona. And as I start any search for any trip, I hop onto Google.com/flights to see what the options are. As we can see, there are three low cost carriers (LCCs) listed in this shot: Norwegian, Ryanair, and Vueling. There are also British Airways flights. If I was to use miles, the cheapest would be to use British Airways Avios – as Avios is a distance based program. But also notice the taxes: $27.50. While that’s a tad cheaper then paying the cost of the LLC, you’re also using miles. Hypothetically, let’s assume you value you points are 1 cent each – you’ve now spent $27.50 + $65, for a total of $92.50 for one passenger, as opposed to $66 (on Ryanair) for two passengers. The one thing to keep in mind is that LCCs charge for every add-on. So if you’re checking a lot of luggage, will have oversized bags or want to select your seat, you may be better of using Avios and paying the taxes. If you find yourself in a similar situation and/or dilemma, hopefully my thought process can helpful. Of course, even if the cash outlay is cheaper than points – on say, a mistake fare or regular cheap ticket – it may not make sense for you if you’re miles rich-cash poor. 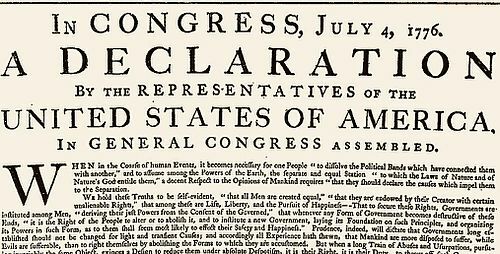 Cover image courtesy of Wikimedia Commons. 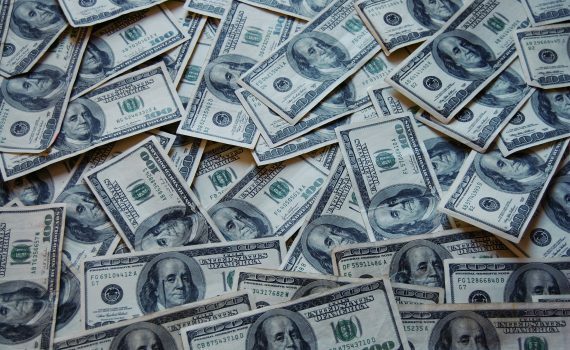 A few weeks ago Doctor of Credit posted about a increased offering from Merill Lynch. As many of you will know, Bank of America and Merill Lynch merged in 2009 during the Recession. 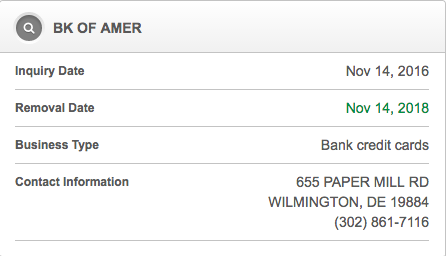 To miles and points enthusiasts, Bank of America is best known for their Alaska Airlines credit cards. Merill Lynch cards, however, have been pretty obscure. Until now. Annual fee $89, but waived the first year. If you purchase a ticket for $500, on one of the above airlines, you’ll be required to spend 25,000 points. This essentially gives you $1,000 in value when using on flights. Bank of America (and Merill Lynch) merge credit pulls. My wife recently applied for this new Merill Lynch card and a Bank of America Alaska Airlines credit card and she only had one pull. Proof is in the pudding. Just note that if you apply for the Merill Lynch card and the Bank of America Alaska Business product (or any Bank of America Business product), it will most likely be a second pull with Experian or an alternative bureau. 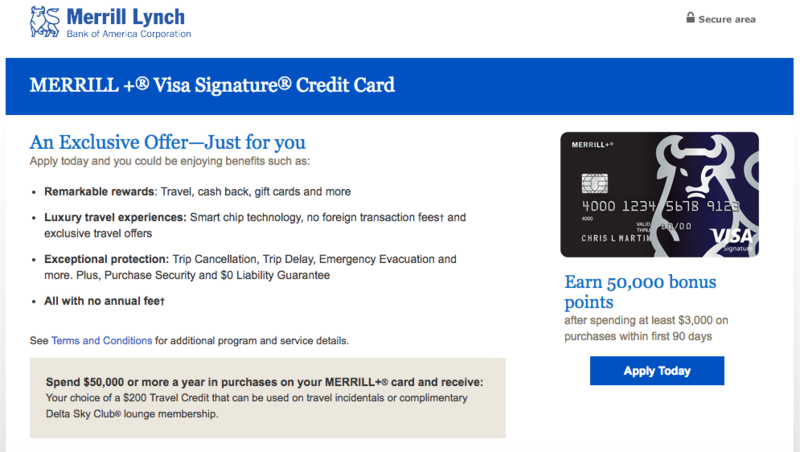 These Merill Lynch points are potentially very lucrative and seem to be easy to earn. Sometimes award space isn’t always available (particularly during peak travel times) and you don’t want to pay cash. Finally, these redemptions will earn elite qualifying miles and points. I typically don’t write about these types of deals, but the offer is too good not to share. AMEX and Uber have had a relationship for a few years now, allowing members to pay for rides using Membership Rewards and/or earn 2X Membership Rewards per dollar when paying with AMEX card which earns those types of points. There have also been sporadic AMEX Offers for $10/$20 off of an Uber ride. While these are all solid options, today AMEX and Uber announced their best promo yet. Today AMEX and Uber announced that they’re offering all AMEX cardholders a total of $130 off in increments of $65 (once per ride) on rides from select U.S. Airports. This is only valid on rides FROM the airport. This promotion ends December 31, 2016. Though this does not include every major airport, there are a bunch of popular ones, particularly around the holiday times. As someone who lives in Manhattan, rides that originate at JFK and terminate in Manhattan are $55 flat rate. After tolls, taxes and tip, the Uber/Taxi comes out to around $70. This promo is a no-brainer! As someone who holds a lot of credit cards, I rarely am lucky enough to receive mail (otherwise known as “mailers” or “targeted mailers”) offers to sign-up for a new card. Typically, the banks and loyalty partners target those who don’t carry a lot of cards, or someone who hasn’t opened up a few recently. Now, there are a lot of theories as to why and how people receive targeted mailers – and while this is all conjectural data, in my experience, I believe that I rarely receive offers because I have a few. Occasionally I’ll receive offers from Bank of America for Alaska Airlines cards (not any personal, just business). More often than not, though, it’s just offers from Discover. Typically, I open up the mailer just to peak, but end up tearing up the offer and throwing it away. Discover doesn’t offer many credit cards and the ones they do focus on cash back. The Discover It card is actually a pretty good offer – they’ll match your spending at the end of the year at 1X to the dollar, unlimited. If you do a lot of unbonused spending, this offering can be pretty lucrative. 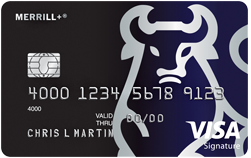 The Discover It card also has rotating cash back categories like the favorite Chase Freedom – except that there’s no option to transfer your Cash Back to a higher level card (like the Sapphire Reserve) and then transfer to airline partners. Most of my spending revolves around acquiring the sign-up bonuses or boosting points balance – so I usually don’t dedicate time to earning much cash back. This weekend I received another mailer and I actually took the time to read the letter. You’ve probably used to a lot of attention from my industry. And depending on how many credit cards you already have (and how often you use them), you’re probably used to ignoring us. And I can understand why. … This mailer pretty much hit the nail on the head with my credit card situation. Kudos to Discover for targeting churners. Did I sign up for the Discover It card? No. But this mailer really made me think about Discover products, this specific product, and fun and creative ways to stand out in marketing and a see of products that can be very similar. And sometimes, it pays off to open the mail – even if you think it will be junk! Cover photo courtesy of Discover.